Located in southern France, bordering Spain and the Mediterranean sea. The Pyrenees mountains climb high to the south, the plains with the rives and coastline bordering the ocean. 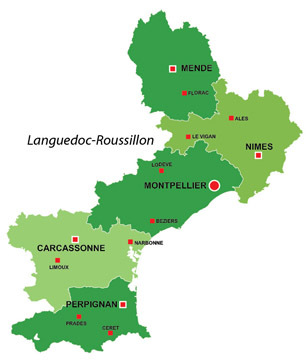 Mono culture of wine, except Rousillion, fruit. 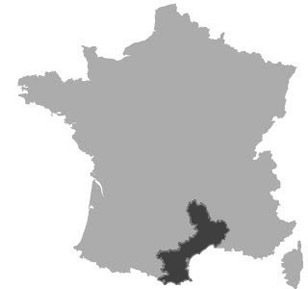 Industries areas are at Nimes and Montpellier. The word Languedoc oridinates from the "Oc" language, the region where once people spoke the language of Oc, whilst in the rest of France the people spoke Oui. 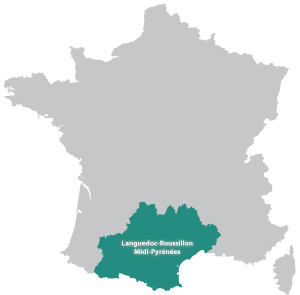 The turbulent history, Roman, Caroligien, Toulouse, Spain then France in 1659. The excellent climate and beaches have made the region a preferred destination for the summer holidays. A region with deep traditions and way of life. The sport of Rugby is very important and played in all towns. The flat-lands of the Camargue with a bull chasing, a strong gypsy influence, the famous white horses and black bulls, rice and wine. Pezenas Properties : A directory of gites and apartments. Aude Chambres D'Hôtes Languedoc : Pretty house 35 kilometers from Carcassone, with 5 bedrooms.